Dr. Burlingham has developed a highly respected transplant basic research program that focuses on acquired immunologic tolerance. His laboratory hopes to gain insight into graft acceptance by studying transplant recipients who have survived even though they have stopped taking immunosuppressive drugs. Specifically, his research focuses on the natural exchange of soluble antigens and low numbers of white blood cells that occurs between mother and child during pregnancy and nursing. The lab’s working hypothesis is that this exchange, which leads to persistence of bone marrow-derived maternal blood cells within the offspring (“microchimerism”) may induce a “natural” form of tolerance. This tolerance, if harnessed, may allow for drug-free acceptance of transplanted grafts. Such natural tolerance has recently been shown to be the result, not of having microchimerism per se, but having a specific type of rare maternal cells capable of producing exosomes— tiny virus-like vesicles composed of lipid, protein, and nucleic acids. The goal is now to investigate how these intercellular messengers modify the host antigen presenting cells, and T cells during tolerance, with a view toward therapeutic applications. 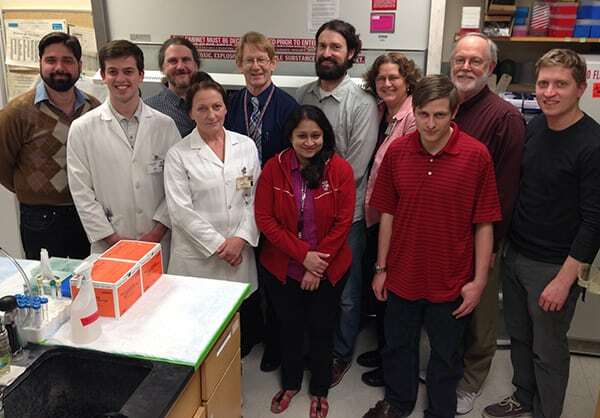 The other major focus of Dr. Burlingham’s lab is the phenomenon of autoimmunity that develops after lung transplantation. A novel type of T Cells, called Th-17, react to collagen type V and cause inflammation and over-production of collagens causing airway blockage and graft loss. His lab is working on ways to inhibit this process by new forms of immune suppressive drugs and by increasing T regulatory cells that normally prevent autoimmune disease.